From age 7 onwards, our daughter, Janeva Salser-Sulman, knew few cars other than Volkswagens. As time passed, she “graduated” from passenger status to assistant mechanic, helping with bleeding the brakes, fetching tools and many other tasks related to maintaining our fleet of Volkswagens. 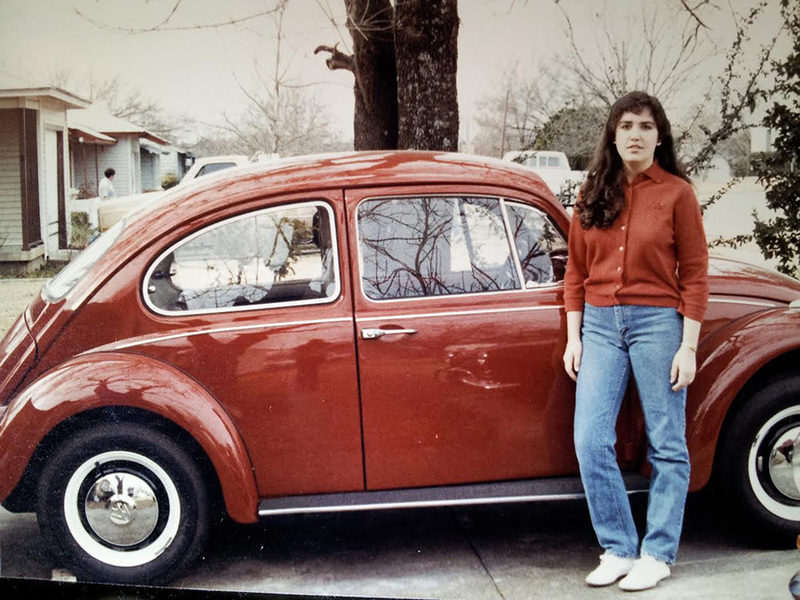 In high school, she learned to drive the stick-shift Beetles, got her license and completed her high school and college years all the while driving one of them. It wasn’t until she had to appear at work in full office attire that she quit the VWs in favor of an air conditioned “alternate vehicle” in order to combat the broiling Texas Summers. Here’s a memory which she wrote and posted to me late last year. Spring 1987 – I was a senior in high school – Daddy was just finishing this car. He had bought it and restored it, painting engine parts, replacing the interior – it was restored inside and out – a SPARKLING RED beauty of a car, and we dubbed it “Cherry Cheeks”. All of our cars had names that fit their character. We had the “Red Baron” who flew across the country on long trips, fighting heat and cold and faithfully carrying 4 passengers and a dog. We had “Friendly”, whose speedometer loved to make noise at about 40 miles an hour, until “he” became demented on a trip to Ft. Worth, screaming so wildly, that Momma pulled off the side of the road and detached the cable from the dial to mute the poor beast. Funny that we never named the Ghia that you see in the reflection – that car is another story. Secretly, I hoped to own and drive “Cherry Cheeks”, but I think that we all knew that “he” was a cash car. Anyhow, one day when we were out working on CC, (by this time, I was Daddy’s side mechanic), a family pulled up in front of our house, and piled out to coo over the car. The conversation ended with their purchase of the vehicle. There was still work to be done on the car and they eagerly agreed to let Daddy finish. Before they left that day, they christened him with their family’s choice of name, “Jeremiah”, and came to visit with him and to check on progress. They eventually moved out of town, but kept in spotty contact for years. The last we heard, “Jeremiah” was still serving faithfully, and was still a beloved family member. Another great story Jay! Great family VW history! The most remarkable thing about your story is that your “Momma” pulled off the road and disconnected the speedometer cable. Janeva, you have had terrific role models and hope you’ll cherish these memories for years to come. J&J – Thank you for sharing! You know what I love most; that these stories connect us all to the same passion. The ’67 Beetle. Yes, Momma and I both had metal fingernail files – metal, because they could be used as emergency screw drivers. We knew the proper idle sound, and on cold days, when the idle was sticky, she and I were well trained how to pop out of the car at a stop light, run ’round and, vroom, vroom, do a gentle manual unsticking of the little arm. Sometimes we even got to use that fingernail file to tighten something. (I still have mine 28 years later!) If the engine made this sound, we had to report it, or if it made that sound, turn the engine off quickly – all driving was a mechanical analytical experience, and reports were turned in nightly. Brakes should feel this way – clutch that…and always, always, keep a sharp eye out for a neglected or lonely looking VW to buy. It’s still delightful to watch for those little cars and go VW shopping with Daddy. That was my second VW dream-come-true. 1. Driving a custom metallic purple ’68 convertible. 2. 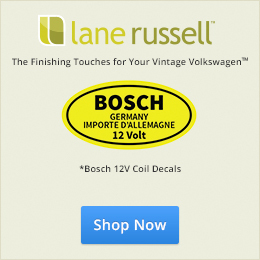 Driving a Karmann Ghia. Ahhhhhhh! Life is goooooood! It’s these stories that make me really happy this site exist.